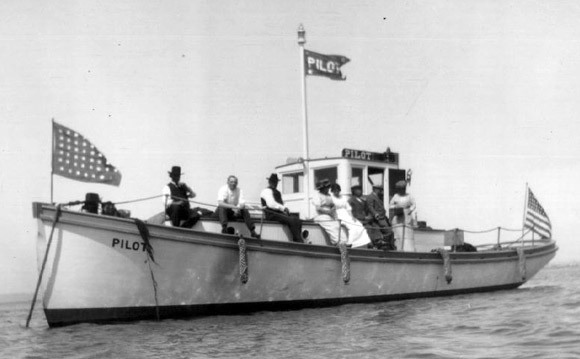 Launched on August 7, 1914, Pilot served as San Diego Bay's official pilot boat for commercial ships entering and leaving the harbor for 82 years. 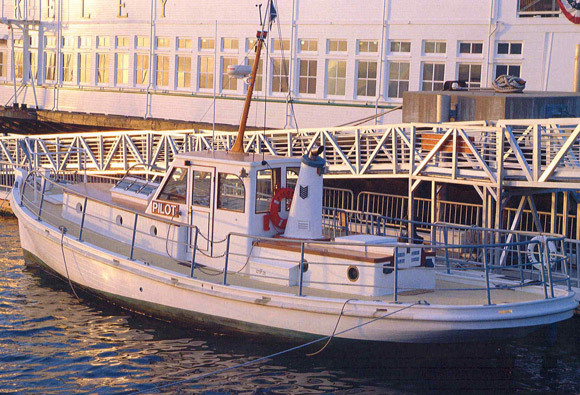 Harbor pilots are responsible for steering large vessels safely into and out of the bay. The pilot boards the ship, takes command, and returns the vessel to the captain after it has docked or left the bay. In World War II, Pilot was taken over for military uses, serving both as a patrol boat and continuing to carry civilian pilots out to ships. After the war, Pilot left military service with a new engine and rebuilt pilothouse, courtesy of the Coast Guard, who had operated her under Navy command. To acknowledge Pilot's role in duty to her country, the Secretary of War authorized the display of six chevrons on her stack, one for every six months of service.